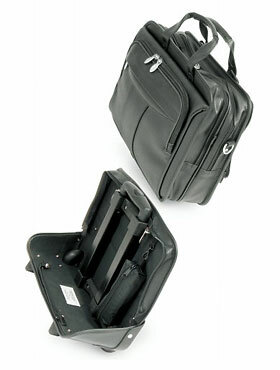 also offers bag options in the form of its “Protocol” luggage line. The collection includes the traditional box briefcase in black and brown ($40), as well as a black leather shoulder bag ($100), pocketed leather shoulder bag ($100) and nylon shoulder bag ($100). A more laptop-friendly model is available for $120. There’s so little to go on here . . . but let’s see what we can do. The Penney website doesn’t seem to have a “traditional box briefcase,” but we’ll pretend Mr. Schneider is talking about the closest thing we could find: the Protocol Business Tote, JCPenney’s “more stylish and colorful take on the ordinary laptop carrying case.” It’s available in the brown with black trim our intrepid reporter found, but also black with black trim and . 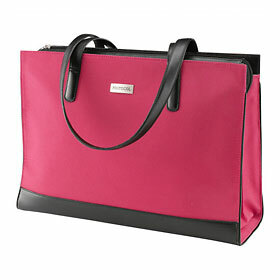 . . red with black trim and pink with black trim (as shown here, for full couldn’t-be-a-man-purse effect). And yes, there’s a different price: $29.99, marked down from $60. See what a smart thing you did by waiting for our comments rather than rushing out and paying full price for whatever Mr. Schneider recommended? 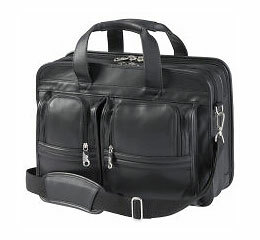 We don’t find anything that resembles the black leather shoulder bag Mr. Schneider describes. But that “pocketed leather shoulder bag,” must be this Protocol Multi-Pocket Leather Portfolio, marked down to $60 from $120. Looks kinda bulky to us, but it’s got pockets. As for a “laptop-friendly” model, we guess he’s talking about this strange concoction: a laptop bag with a wheeled docking station. Now why didn’t this bag make the headline of Mr. Schneider’s story? Docking Man Purses and the Men Who Wheel Them. This is surely revolutionary: a bag you can wheel, and then when your small child gets jealous, you can throw the laptop case on your shoulder and give the kid a ride in the separate wheeling jig! We imagine this would have been the perfect carrying case for the old Macintosh Duo. Maybe they’ll sell a version next with power supplies built into the wheeled base, so you can charge the phone, PDA, iPod, and laptop in the shoulder bag all at once, with a single zip! Our review ends here, though Mr. Schneider continues to one final store, where we cannot shop online: T.J. Maxx. There he drops names of designer-label bags from Samsonite, Polo Ralph Lauren, Latico, Naj Oleari, Kenneth Cole, and Rawlings. Show off. This entry was posted on Monday, March 27th, 2006 at 7:00 am	and is filed under Buyers' Guides, Laptop Bags, Man Bags, Manufacturers, Stores, Wheeled Bags. You can follow any responses to this entry through the RSS 2.0 feed. You can leave a response, or trackback from your own site.